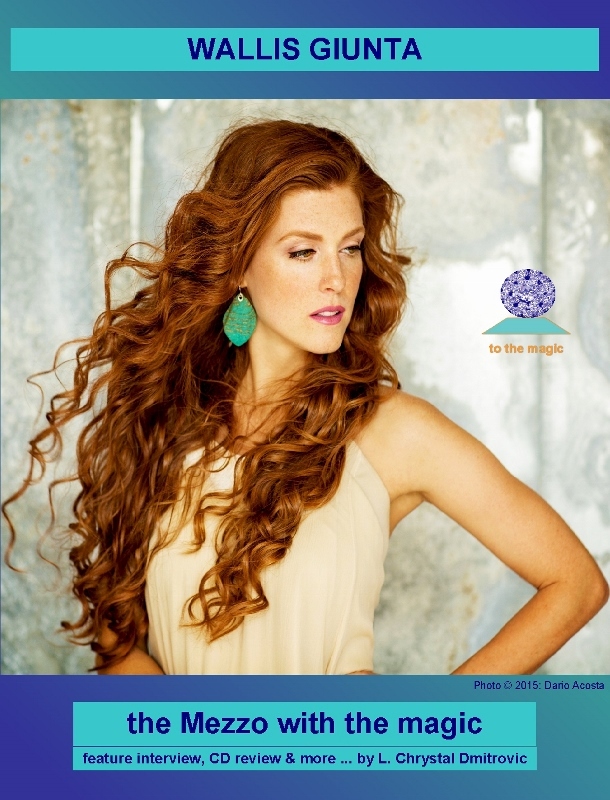 Wallis Giunta is one divine, vivacious redhead who seems to have found her perfect balance on the edge of an exciting whirlwind. As a young, talented singer who is self-admittedly wildly creative in her approaches to life and her music, with that kind of impetuous, enthusiastic to-the-enth focus, she has already made a few unique marks in her music world career – serious and otherwise. An operatic Mezzo Soprano known also for “pants roles,” she is equally at home as a chanteuse of moody torch songs. She’s a lady who can sing the blues with kindred soul, and the dramatic lieder with all adeptness, and she has maturity and sensitivity toward genre and song eras that reveal mastery and experience, suggesting that she has dedicated an extraordinary amount of time perfecting her singing art. Since 2012, she has made an astonishing number of debuts with opera companies the world over, with return engagements fulfilled or in the wings, and as a devoted recitalist has performed in many North American festivals, and in concert and also in solo productions. A successful 2014 recital tour of Kurt Weill’s The Seven Deadly Sins to Miami, New York, Toronto and Ottawa, will, for example, see a revival with The Toronto Symphony in June, 2017. Her voice dances with graceful aplomb to piano accompaniment or full orchestra. She has great command and ease of punctuation in any sung language, and doesn’t pull any punches when it comes to going for high or low notes not usually in her range. She’ll expertly employ gesture according to the opera, and in recital has been seen to use gesture as she sees fit, or as the emotion of a song encourages it. Many an actor from the stage or film can admit that when the emotion of a line or lyric is genuinely felt, it suffuses the mind, body and the vocal – and likewise the musical entertainer finds that the spontaneity erupts in thrilling lyrical tones most effortlessly in time and tune to the twists and turns of the libretto. LC: A love for music or art has a definite start point somewhere for everyone. How did it all begin for you, Wallis? Did you hear a pop song on the radio? Do you remember when you first heard an operatic song and discovered that you liked it? Wallis: My parents got a Maria Callas recording when I was 6 or 7 years old (a Best-Of CD, I believe), and whenever they played it I would sing along and imitate her. I’m sure I was terrible, but I remember loving the feeling of singing in that way, and I guess I was hooked. LC: While you were very young, did your family in any way encourage a love for music and song, and if so, how? Wallis: Yes, my parents started me in piano at age five, which I kept up for 10 years, and they were wonderfully supportive of my decision to start singing seriously when I was about 8. I joined a choir then, and started private singing lessons soon after that. I don’t think I’ll ever be able to repay my mum for all the hours she spent driving me to my lessons, and nail-biting her way through my early singing competitions! My sister and brother are also musical, and it was awesome to have them to make music with when we were young. We had some pretty entertaining family sing-alongs on long car rides. LC: Part of your formal training included studying under Canadian-born Edith Wiens, who had studied and performed in Germany, and who is now a faculty professor of voice at The Juilliard School. As an operatic singer of note, as one of your teachers and mentors also with the the Lindemann Program at the Met, what did she especially impart to you over the years about performance and being a singer, aside from technicalities? Are you still under her guidance today? Wallis: I do still study with Edith, at every chance I get! What I love about our work together is that she addresses every aspect of the singer’s preparation, from language skills to intention, poise, vocal colour, and, of course, technique. Also, as someone who has had such an important performing career, she can draw on her personal experience to offer invaluable professional advice. Very few teachers are in a position to do that, actually, so I consider myself lucky. Edith’s greatest asset as a teacher, though, is her ability to inspire us students to be as genuine, unique and sincere as possible. She is not interested in the superficial presentation, but in a deep, connected artistry that comes from each singer’s place of inner beauty. She is very inspiring. 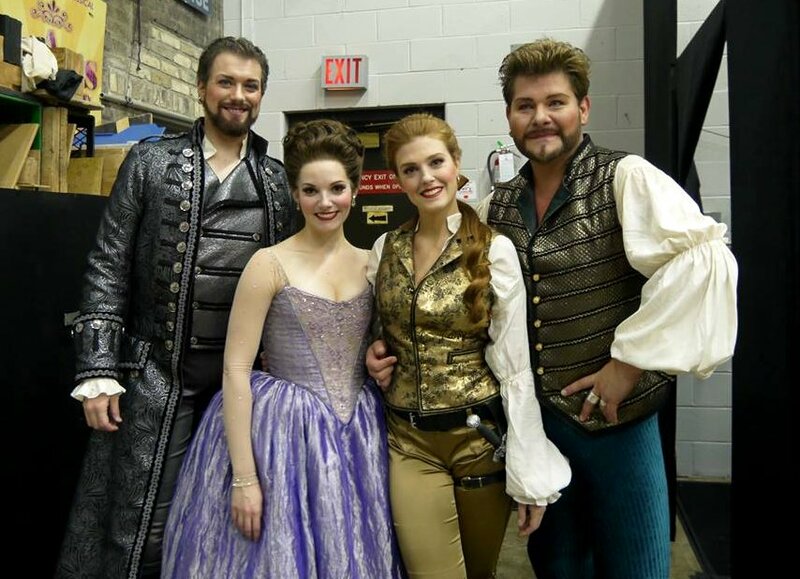 LC: The same year you graduated from the Lindemann Program and Juilliard’s Opera Studies, you, for example, made your Metropolitan Opera debut in Rigoletto, and in the roles of Sesto and Annio in Mozart’s La Clemenza di Tito with the Canadian Opera Company (COC). Your talent for rapid “runs” has been mentioned by a reviewer in regard to your performance in this opera Mozart’s CLEMENZA DI TITO. In a later video of you in recital you so clearly enjoy performing Sesto’s aria. To demonstrate such virtuosity in a debut is commendable. Wallis: I absolutely love singing coloratura runs! My voice is naturally suited to that style, and I find it just the right kind of challenge for me – mastering the high flying demands of Handel, Vivaldi, Rossini, and to a degree, Mozart. I’m going to try and keep that style in my repertoire as long as I can. LC: When and how did you discover that you were meant to be a mezzo, that it was your most comfortable range? Did you always want to be a mezzo, or was mezzo something that chose you and you realized that you had found your musical calling? Were you inspired to become a singer by any specific mezzo-soprano? Wallis: I started as a soprano early on, and switched to mezzo at age 19. It was something suggested by my wonderful teacher in Toronto, Jean MacPhail. She heard one note out of my mouth, and had me switched to lower repertoire right away. I’m super comfortable in this range, and I know we made the right choice early on. LC: A mezzo is often challenged with coloratura passages and spinto soprano ranges. When I read some reviews of your performances, at times I sensed that the reviewers wanted to put you in the soprano category. Lindsay Christians wrote about your “Una voce poco fa” in The Barber of Seville: “Her high notes soared; her embellishments sounded effortless.” Do you think one day that you might naturally move into the realm of a soprano? Wallis: No, I don’t think so. Reviewers always hear their own thing, and that’s just fine – of course they are entitled to their subjective opinion. But I know what works for me, and I’m quite happy where I am. LC: Some reviewers have described your voice as having amber and chocolaty qualities, denoting richness. I must agree, your voice is absolutely gorgeous in mid-range, and also gives sensational thrills and delightful chills on high notes that are pure, unrestrained and in perfect pitch. Is this kind of versatility of the perceptions of your voice’s nature something you hope to expand in the future? Wallis: Thank you! The lovely thing about being a singer is that our voices change constantly, all throughout our lives. Some days I wake up and feel like I’ve developed new colours overnight. I’m not going to try and actively cultivate anything, but I look forward to seeing where my voice goes with time. LC: Do you sing other languages phonetically, or did you gain a working knowledge of a language first? You are very intuitive and expressive in German, French and Spanish. Your dramatic delivery of Schubert’s “Am Feierabend,” to put it plainly, is shockingly brilliant. Although the situation is from a more innocent time, that worker’s “party time” never came to his desired fruition, intensely hoping he would impress the milkmaid and be noticed by her. You so evocatively captured the worker’s multifaceted feelings when transposing from the English to the German. How does that process go for you, from your initial sight reading? Would notice my faithful thoughts! Ah, why is my arm so weak? Every lad does it just as well as I do. Wallis: I don’t speak German fluently (yet! ), but I make sure to deeply acquaint myself with the translation of whatever I am singing, in German, or any language that’s not my mother tongue. I have to be able to tell the story to communicate effectively, which requires an understanding of what I’m saying. I usually translate first, and then learn the music with my phonetic understanding of the original text. It used to take a lot of time to learn a new song/aria, but I’m pretty quick about it now. LC: You also recently stated that you are currently on a Strauss Lieder bent; what is it about those poetic songs that made you record Strauss’ first three opuses? Is this CD available yet? You mentioned you viewed contemporary German tenor Jonas Kaufman as your gold standard for the interpretation of the music. What is the specific appeal for you about Kaufman’s style and affinity for Strauss Lieder? Wallis: I had the opportunity to record the Strauss with a pianist colleague of mine, Carson Becke, who is a Strauss scholar and Doctoral Candidate at Oxford. He is putting together three CDs of all of Strauss’s early works, and I was the lucky singer he chose to collaborate with on the vocal CD. And yes, our recording is available on iTunes! I love the passion with which Kauffman interprets everything he does, and I think he’s particularly suited to Strauss. Plus, as a German, he has an undeniable authenticity. 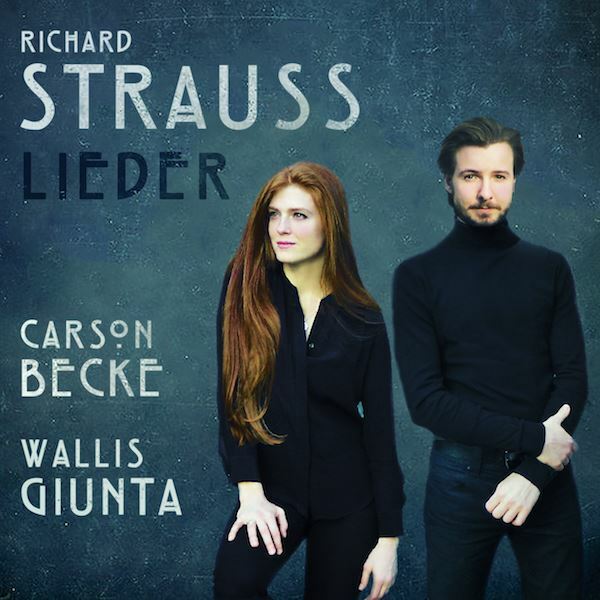 As related by Wallis about her latest CD release: Pianist Carson Becke and I have some very exciting news, with the iTunes release of our Richard Strauss Lieder album! It was recorded in 2014 at the Festival Pontiac Enchanté. We’re so grateful to Ulysses Arts for their help with the release and mastering! LC: You’ve played the Cherubino “trousers” role on more than one occasion, in which you delightfully stir the pot of audience and critic reactions. Everyday Opera wrote: “Wallis Giunta in the famous Cherubino “pants role” more than nailed the overly comedic character. [She] let her full mezzo-soprano voice sing out, creating a wonderful performance within her “Non so più cosa son cosa faccio” aria in the first act. Between her hilarious over-the-top antics and the way she used a full, round sound, with strong initial phrase attacks in a seemingly effortless manner to deepen her voice, she was able to portray a believable, girl-crazy, young boy.” Was this as much fun for you as it was for the viewer and listener? Wallis: Yes, it sure was! That production was really special to me, as it was in my hometown of Ottawa, and also on the same stage where I sang in my first ever opera, in the chorus of Madama Butterfly at age 15…which is about the age of Cherubino. 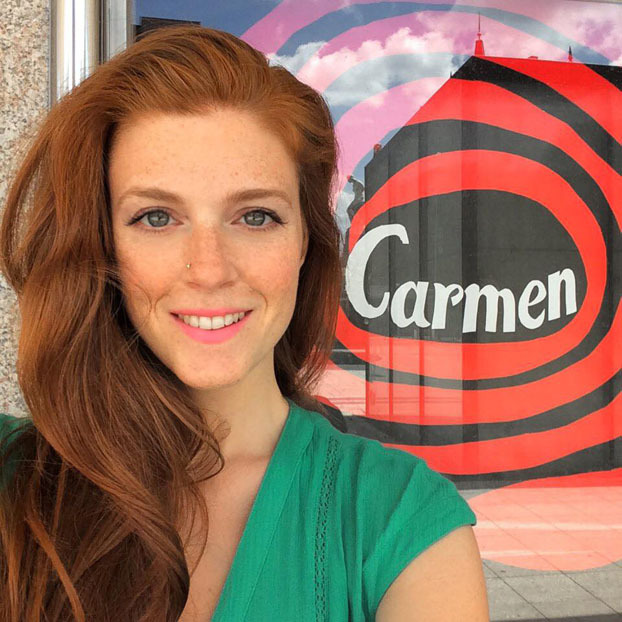 LC: About the 2012 production of Mozart’s Marriage of Figaro with the Fort Worth Opera, Theatre Jones, John Norine Jr. wrote: “One of the subplots…concerns the page, Cherubino sung by mezzo soprano Wallis Giunta. Highly physical, Giunta has to sing while on her back, under a couch, and almost every other position imaginable. Through all of this, she manages to maintain a beautiful tone and excellent diction.” Some might say this would be a miracle to accomplish, but in reality of course was the result of hard work. What kind of choreography and rehearsal do you go through to achieve such impeccable timing for comedy and song? Wallis: It really varies; some productions come together in just a few days if they’re remounts, or it could be as long as 6-7 weeks for a new production. The average is about 3-4 weeks, and I think that’s what we had in Fort Worth. What makes it easier, though, is when you revisit a role for the second, third, fourth time, and you no longer have to think about the singing the same way. You can just explore the character! LC: As Angelina in the title role in Rossini’s La Cenerentola at Oper Leipzig in 2016 your versatility in “Non più mesta” while so dramatic and melodically in the mezzo range, you were described in Opernnetz by Andreas H. Höscherby as achieving “the difficult coloratura and parlando sections with seemingly effortless ease.” Did you find that to be technically true for yourself as well for the wonderfully, incredibly beautiful “Naqui all’affanno” aria in Act II? Wallis: I was really happy with my first Rossini role, in Leipzig this past season. While I am sure I can improve, and I definitely plan to, I think I’m quite well suited to this repertoire, which shows off the better aspects of my voice and technique. I’m grateful for the chance to sing Angelina again this season, for Opera North in the UK. LC: Your voice and virtuosity, at least to me, very much call to mind Julia Hamari, the famous Hungarian mezzo who also played Angelina in La Cenerentola. Have you ever experienced or felt any kinship or similarities with her voice and repertoire? Or whom might you compare yourself vocally with present and historical singers? Wallis: I have often been compared by others to Frederica von Stade, but I really feel a kinship with Teresa Berganza. I think it’s something about her temperament and passion that I identify with. She was so seductive through her perfect combination of restraint and abandon. 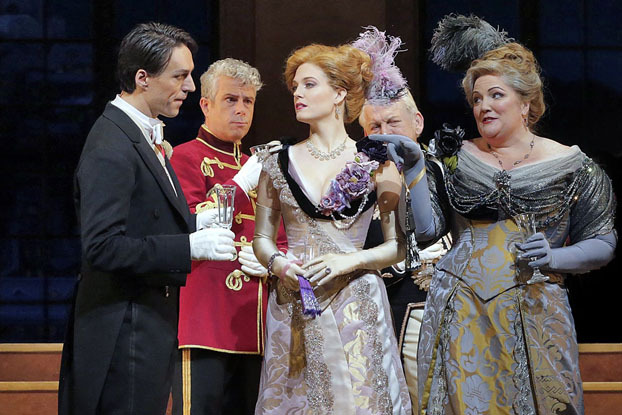 LC: You were among the cast as Olga with Renee Fleming during your 2015 return to the Metropolitan Opera in their production of The Merry Widow. Any special moments or highlights to share? LC: 2015 also saw you in roles in your first Wagner operas, Parsifal and Die Walküre, and also as Mercédès in Carmen at Oper Frankfurt. Was Wagner as dark and foreboding as its customary reputation or did you have a previous acquaintance with the treasure trove of his musical depths and impressions? Wallis: I had only ever been an audience member for Wagner operas before last season – I never had sung it. I have to say, I like his operas even more from the stage than the audience! It’s incredible to be a part of that kind of music making. LC: Listening to you sing “Il padre adorato” from Idomeneo by Mozart, your voice is full and rich seeming to naturally find those sweet spots in the hall. Equally bravura, is you in recital with Peter Dugan on piano in July 2015’s Music and Beyond Festival for Parto, Parto,” Sesto’s aria from La Clemenza di Tito also by Mozart. Generally, whether in the larger venue, or the smaller hall, what do you seek out first to take full advantage to accent a performance? Are there any other prerequisites like knowing the acoustics? Do you favour a particular talisman for good vibes – perhaps similar in practice to our Canadian Finance ministers wearing new shoes when delivering government budgets in parliament? Wallis: I consider myself lucky to NOT have any superstitions or pre-requisites, actually, because if I ever was deprived of my needed ritual, I would not want to feel like I couldn’t go on without it! I do like to test out a space before I perform in it, and get enough water the day of, but otherwise, I’m pretty easy going. LC: As with many singers, Handel’s Messiah is part of your repertoire. Is there any song in the oratorio that is especially significant or meaningful to you, and that you enjoy singing either solo or in chorus? Wallis: I simply adore the chorus “All we like sheep”. I think it is brilliant and delightful, and it makes me happy to hear it. I always quietly sing along whenever I am on stage for that part. 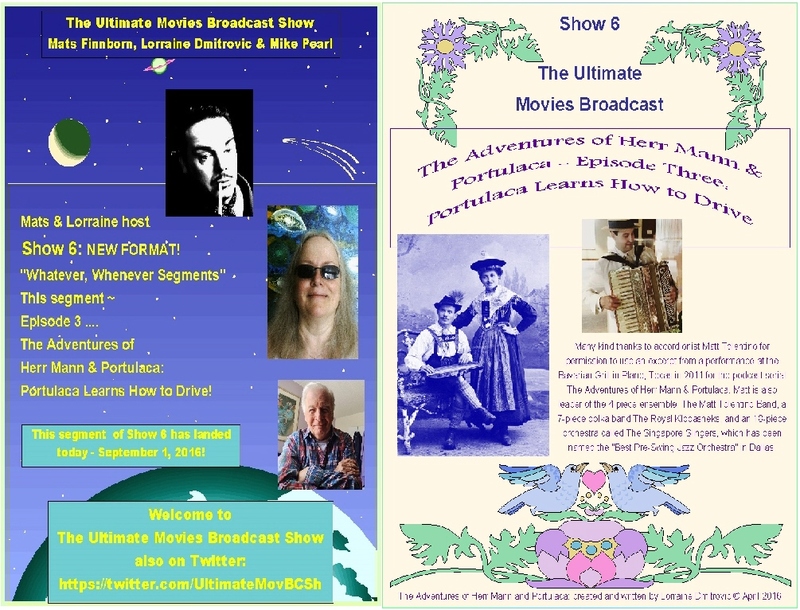 LC: You are featured on the 2014 CD “Music for Great Films of the Silent Era, Vol. 2,” issued by NAXOS. What was the attraction for you to do the project? LC: Your sister has accompanied you in recital on acoustic guitar. How did that evolve? You must be fans of each others music. Wallis: I do love my sister’s original music, and I have always loved making music WITH her. We have been singing together since we were little kids, in choirs, musicals, and around the campfire, and I will include her in my performances any chance I can get. She is a wonderful singer in her own right, but also an amazing guitar player, which comes in handy, as I am a terrible guitar player. LC: Is there an operatic role, invented/borrowed from another musical genre, that you would like to perform if given the opportunity? You’ve mentioned The Who’s Quadrophenia as Pete Townsend’s masterpiece, and that you would love to take on Jimmy as a pants role. What is it about Quadrophenia that fascinates you, and are there any other contemporary original music albums/singles or stage plays/musicals you could envision as fresh, new operatic productions? Wallis: I grew up listening to The Who, and Jimmy’s story just really touched a nerve for me when I was in high school. I think it would make a perfect opera, and a really cool bridge between the two genres. I also think it’s high time for Shakespeare’s Twelfth Night to be an opera. Viola really needs to be sung by a mezzo, and I volunteer. LC: You’ve mentioned that John Lennon’s “Imagine” is a favourite song and that it restores balance to your life; you sing it a capella in recitals. What specifically makes it meaningful to you? The lyrics, the melody, Lennon’s calm delivery? Did it bring you comfort at some point in your life? It is a song that certainly restores faith and strength when you hear what is going on the world today at times. Is it also because you can “see” the peaceful world that Lennon envisions? Wallis: It’s definitely the lyrics, but also the hopeful rise of the melody in the chorus. I feel like it’s pure and perfect, as a song. I really respect Lennon for what he stood for, what he sacrificed, and what he inspired in so may of us, and that song is his legacy. LC: What are among your other favourite songs, no matter the musical genre? A personal favourite role, either operatic or musical entertainer? Do you have a favourite contemporary composer, and why? And do you especially like any historical composers whose operatic works you think should be staged more often? Wallis: I really love alt-country, folk, bluegrass, and the music of Ray Lamontagne, Patty Griffin, Alison Krauss and Emmylou Harris. I could name you hundreds of songs! There are too many. A favourite role would be Iago in Verdi’s Otello. My favourite contemporary composer would be John Adams, I think. He chooses such powerful subject matter, and his musical textures can be breathtaking. I am always looking for more Monteverdi to be performed. His work is utter brilliance, and so potent and applicable today! LC: What role of any opera and/or in musical theatre has been the most fun to perform? What role likewise have you found to be the most challenging? Wallis: I love to sing Britten most of all, and I think Hermia in A Midsummer Night’s Dream has been a favourite. I found Annio in La Clemenza di Tito to be the most challenging, as it sits very high for me – and because he’s just such a good guy, he’s kind of hard to bring to life in a vivid way. It’s always easier to get into the more complicated and troubled characters. LC: You have literally sung in recital, in various symphony concerts and opera productions worldwide the last number of years. It sounds like you maybe have spent quite a bit of time rehearsing and residing in hotel rooms, and travelling on planes, trains, buses and automobiles. Have you ever found yourself spontaneously breaking into song solo, or with coperformers in a company, while perhaps refining a passage or phrase or just shouting out for joy, much to the delight of a driver or airbound audience? LC: What has your musical and operatic journey so far meant to you? What has it revealed to you about yourself and what you’re capable of. What did you discover about music and yourself that you didn’t know before? And, are you ready for the next “leap”? Wallis: I am so fortunate for the career I have, and there’s not a day I take it for granted. I’ve discovered along the way how thick of a skin I have, but at the same time, how fragile I am. I have learned to be self-reliant, independent, to not compare myself to others, and to strive for my artistic truth. Yeah, I think I’m as ready as I’ll ever be for what life has in store for me. Truly, Wallis is the Mezzo with the magic, traversing the world – perhaps waving from a mountaintop or posing in a resplendent gown on The Met stage – but always in a cascade of music and joy. 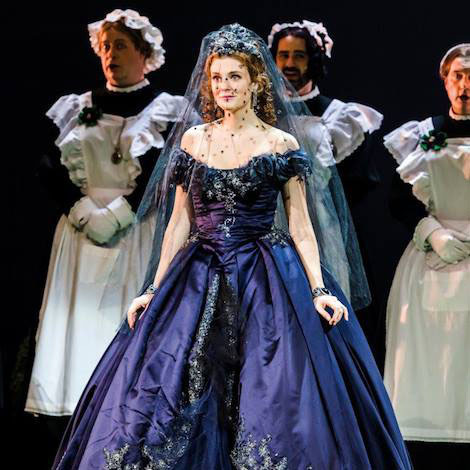 She’ll soon appear as Dido in Opera Atelier’s production of Purcell’s Dido and Aeneas at the Elgin Theatre in Toronto, running on selected days from October 22 to 29. About this scene? Well, there were a few similar ones as well. 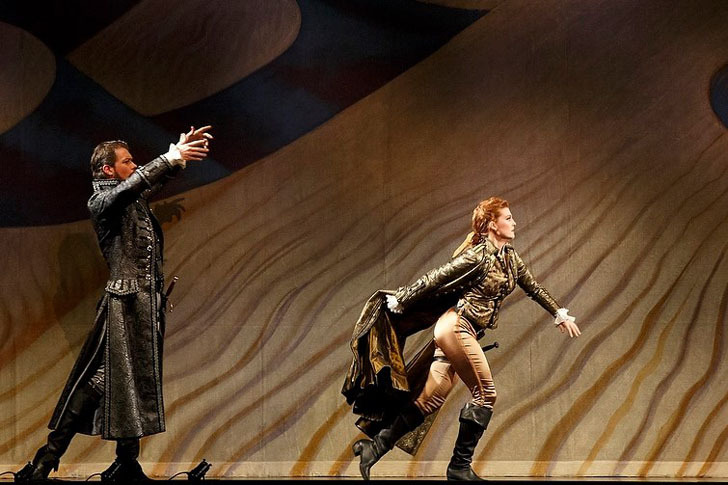 Bradamante (played by Wallis Giunta) ran away from me and toward her love interest so many times that I simply can’t recall which particular time that was!!! Either I said something that annoyed her, like “be patient,” or “be careful,” and that was enough for her to be on her way! I feel that our performances quite complimented each other in this scene. Wallis is an extremely focused and ambitious performer. She wants to act and sing her best. She observed a lot, and did the work. Her role was leading pretty much every scene, dramatically, and I hope she felt my experience made her work easier. Our scenes were all about flow, tension and – for my character – to try to guide Bradamante’s incredible dramatic drive. What I think especially stood out about this scene, and other scenes with Wallis and myself in the production, was how far out of control Bradamante’s emotions are, which worked really well. Kudos to Marshall’s incredible work in making every scene as interesting as could possibly be! Personally, I enjoyed every detail of the Alcina production. The amazing visual aspect of it. Set, costumes, lighting effects and projections. And the horn playing! Alison McHardy’s big bravura aria where she puts her armour on features some great horn music! It’s beautifully thrilling and not easy to play, I can tell you that!!! Although my role was not extensive, it was a production I was really happy to be part of. My colleagues’ performances were just fabulous, and I was happy to witness some of those magnificent scenes over and over!